High-throughput mRNA sequencing (RNA-Seq) is widely used for transcript quantification of gene isoforms. 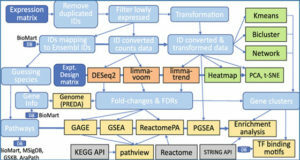 Since RNA-Seq data alone is often not sufficient to accurately identify the read origins from the isoforms for quantification, researchers at the University of Minnesota Twin Cities proposed to explore protein domain-domain interactions as prior knowledge for integrative analysis with RNA-Seq data. 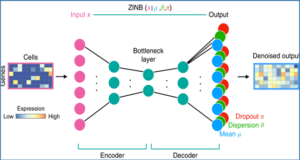 They have developed a Network-based method for RNA-Seq-based Transcript Quantification (Net-RSTQ) to integrate protein domain-domain interaction network with short read alignments for transcript abundance estimation. Based on their observation that the abundances of the neighboring isoforms by domain-domain interactions in the network are positively correlated, Net-RSTQ models the expression of the neighboring transcripts as Dirichlet priors on the likelihood of the observed read alignments against the transcripts in one gene. The transcript abundances of all the genes are then jointly estimated with alternating optimization of multiple EM problems. In simulation Net-RSTQ effectively improved isoform transcript quantifications when isoform co-expressions correlate with their interactions. qRT-PCR results on 25 multi-isoform genes in a stem cell line, an ovarian cancer cell line, and a breast cancer cell line also showed that Net-RSTQ estimated more consistent isoform proportions with RNA-Seq data. 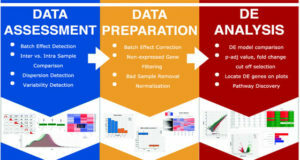 In the experiments on the RNA-Seq data in The Cancer Genome Atlas (TCGA), the transcript abundances estimated by Net-RSTQ are more informative for patient sample classification of ovarian cancer, breast cancer and lung cancer. All experimental results collectively support that Net-RSTQ is a promising approach for isoform quantification. 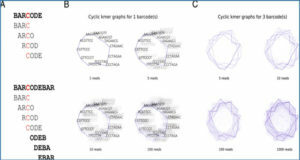 An isoform transcript network based on protein domain-domain interactions. 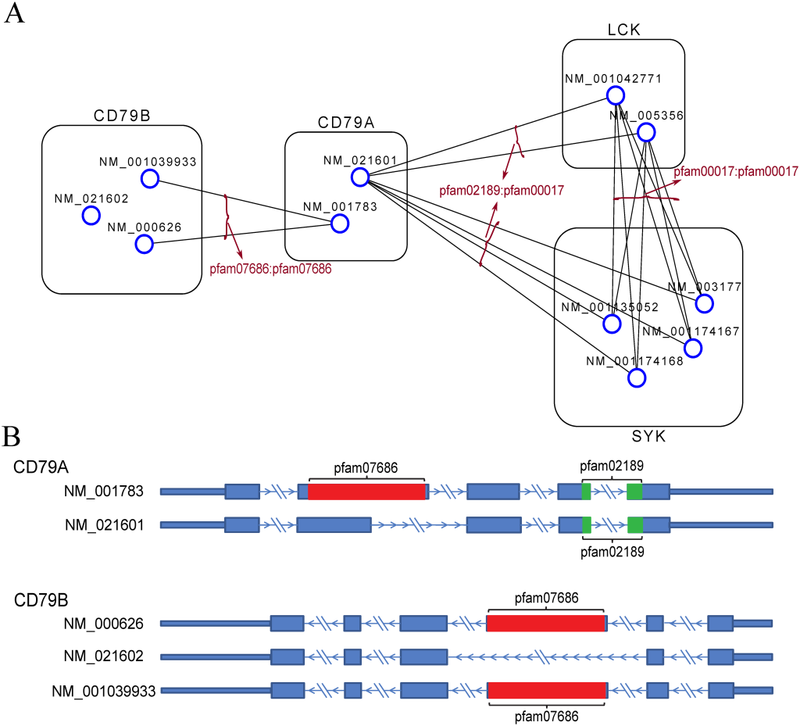 (A) The subnetwork shows the domain-domain interactions among transcripts from four human genes, CD79B, CD79A, LCK and SYK. In the network, the nodes represent isoform transcripts, which are further grouped and annotated by their gene name; and the edges represent domain-domain interactions between two transcripts. Each edge is also annotated by the interacting domains in the two transcripts. (B) RefSeq transcript annotations of CD79A and CD79B are shown with Pfam domain marked in color. The Pfam domains were detected with Pfam-Scan software. Note that no interaction is included between transcripts NM_001039933 and NM_000626 of gene CD79B without assuming self-interactions for modeling simplicity. 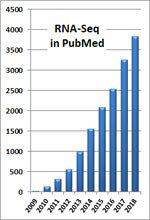 For better visualization, only the interactions coincide with PPI are shown in the figure.